A couple say their "dream home" has become a "nightmare from hell" after discovering hundreds of faults. Phil and Nicola Bentley bought the house off-plan from Persimmon in 2017 but when they moved in a year later they found 700 defects. 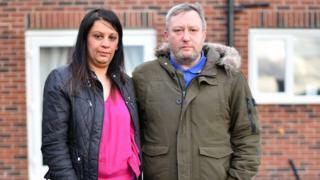 The couple said their year-long struggle to get the firm to fix their £280,000 house in Kippax, near Leeds, had "nearly broken us as a family". Persimmon said it acknowledged the home "did not meet our intended standards". The couple, who have two children aged 11 and 15, said within days of moving in they identified a host of problems, including doors that did not fit properly and holes in the plasterwork. They also discovered architraves which were not level, cracking around the window boards, bubbled paintwork and lumpy and uneven turf in the garden. Mrs Bentley said they had been in regular contact with Persimmon but only about 10% of the defects had been repaired. She said: "We are living in a building site, we haven't been able to put any photos up on the walls and there is just a TV and sofa in the living room. "It's been horrendous and the worst year of our lives. "They keep apologising but apologies aren't good enough. I just want our house finished and I want it right." The couple said they were not allowed to inspect the property before moving in and when they asked a solicitor about pulling out of the deal they were told it would cost up to £15,000. A spokesperson for Persimmon Homes West Yorkshire said: "We acknowledge that Mr and Mrs Bentley's home did not meet our intended standards and regret the inconvenience this has caused them. "We let customers inspect their property prior to exchange if it is safe to do so. Mr and Mrs Bentley's property was still under construction at this stage, therefore an inspection was not possible. "We have pledged to work with the couple to resolve what we believe are the final items of work."